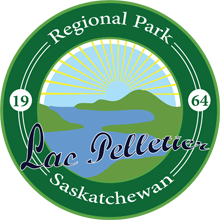 Lac Pelletier Park is a great place to enjoy the outdoors even when the temperature falls below zero. Snowy winters make the park a great place to snowshoe, cross country ski, toboggan and snowmobile. But keep in mind, park bylaws prohibit the use of ATVs or snowmobiles anywhere on park property so limit the use of these to the ice surface on the lake. Also, please don’t not drive snowmobiles or ATVs on the walking path as they damage the cloth laid under the rock chip base.